It had been years since I last factored a polynomial. I had forgotten how to derive the quadratic formula. Clearly it was time for a math review. I picked up Precalculus Mathematics in a Nutshell from the Boulder Labs Library; it was just what I needed. The book by George F. Simmons zips through geometry, algebra, and trigonometry in about a hundred pages of amazingly complete and readable prose. Each section is independent of the others, so it is perfect for a quick review of any of the three topics alone. The book is sparsely populated with exercises, just enough to get a solid grasp of each topic. The exercises, as in any good math book, reveal insights beyond those illustrated in the text. I can't imagine a better tool for review, but the book probably wouldn't serve well as a first introduction to the subjects (except perhaps in the hands of the right teacher). 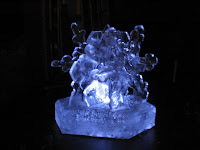 Yukio Matsuo's Ice Sculpture is a marvelous book, really two books in one. The first is filled with full-color photographs of the master's work, ranging from traditional culinary pieces to original abstract sculptures. Many of them demonstrate the sculptor's distinctive style. The second is a series of sketches, diagrams, and notes that concisely illustrate how to carve each of the depicted pieces. Wonderful! I stopped by Colorado Plastic Products in Boulder today. They sell scraps of all sorts of materials, including high density polyethylene (HDPE), polytetrafluoroethylene (PTFE/Teflon), and ultra-high molecular weight polyethylene (UHMWPE), all of which are attractive for making ice carving tools. I needed a low friction surface for a new hot wire ice cutter I'm working on, so I picked out a nice sheet of UHMWPE. It has terrific properties for the application, including a low coefficient of friction, low water absorption, and a wide operating temperature range. 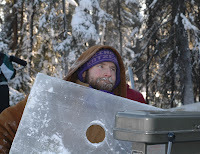 Lars had suggested the stuff because it is used for ski bases and dog sled runners, so it should work very well. Lars and Sharon visited us in Colorado a couple weeks ago as a part of a post-wedding tour of the lower 48. We took full advantage of the opportunity to start planning for Ice Art 2008. After touring Celestial Seasonings (Sharon's favorite part of the trip), we enjoyed an Ethiopian dinner with Keith and Andy, both ice scientists! It was an excellent opportunity to explore ideas for ice machines, but, more importantly, it was a good time in good company. The first snow has come and gone. The days are getting shorter. It's the time of year when Lars and I start talking about ice. It must be time to revive the blog. We spent a great deal of time on Sunday and Monday in the shop at Belfair. 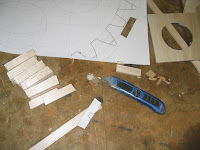 I spent most of the time working on a hot wire gear cutter for the large gear. Lars worked on a number of things, including the super router that has become known as Julie. 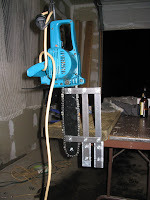 Originally envisioned as an attachment for a drill press, Julie ended up being constructed with her own motor. Nephew Gary helped out by building a large nailboard that we call The Devil's Backscratcher or Old Scratch. We showed up early and set up hundreds of pounds of equipment this morning before the 9:00 starting time. We spent the morning carving large slabs of ice off of our block and making a pad of ice upon which we will build our sculpture. The pad is made of hard-packed snow that has been leveled. After leveling the snow, we dribbled cold water onto it a few times, did some sanding, and eventually got it to the point where we could pour water onto it like a skating rink. By lunch we had a fairly slippery rink and were starting to carve structural pieces out of our slabs. Not a single slab has yet broken! The giant chainsaw is working flawlessly, as is every other tool. Wow! We look like we sort of know what we are doing! After a delightfully uneventful flight to Fairbanks, Lars and I spent two days hard at work in the shop at Belfair. We have so many wonderful tools this year! I'll have to post photos of them, but I am unable to at the moment. At Ice Park today we drew site number 42. Excellent! If you are in Fairbanks, we hope you'll visit us over the next three days. We've already unloaded some equipment at the site, and the rest of our stuff is ready to go in the morning. 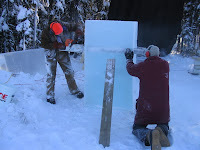 Our ice block has been oriented and placed (something that didn't happen until the first morning of competition last year), so we are ready to attack the ice with the giant chainsaw at 9:00 AM sharp. I checked my email one last time before leaving for a long day of travel only to find a notice telling me that we had been bumped to a much later flight. Our first flight of the day was canceled. Other than the fact that we don't get to join Lars and Sharon for dinner tonight, our new itinerary is actually much better. This change cut our total travel time from thirteen hours down to seven hours, and it pretty much gives us a whole extra day. "I just heard that the SAW IS READY!! Peligro Will Robinson!" So said Lars before he went to pick it up. He now has the giant chainsaw, and it is ready to go! We've settled on a design and are making last minute preparations for next week's event. I've had a cold for the last few days, so my first priority has been to get healthy; I don't want to head to Fairbanks feeling less than 100%. Lars has been very busy working on tools. 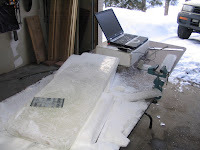 He welded up a new drill press table (the "Drill Press Table X-2007 HD") and has done some ice axle testing. He is also trying to put together a hot tubing ice cutter to try out. The high temperature in Fairbanks is supposed to be -20°F from today through Sunday, but they say it should be warmer (lows near 0°F) next week. The word from Ice Alaska is that the ice harvest for the single block has been completed and that the ice this year is 31 inches thick, not counting a little white ice. This is quite a bit thinner than last year's block, but it should be plenty of ice for the music box. Hopefully the cold spell won't crack the ice too much. We thought that we would have to resort to building eight or nine hammers, but now we have a design that only requires four hammers, one for each chime. The red thing is a cam that turns clockwise when the crank is turned. 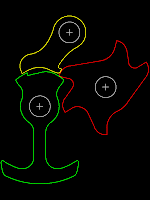 Each lobe of the cam lifts the hammer (green) and pawl (yellow), and then releases them in that order. When released, the hammer swings once toward the chime on the left (not pictured) and then swings back toward the cocked position. By the time the hammer returns, the pawl has been released and is able to catch the hammer mostly cocked. If the crank is turned too fast, the pawl is released in time to catch the hammer after only a fraction of a swing, preventing the hammer from hitting the next lobe on the cam with damaging force. The pawl limits the tempo at which the tune may be played, catches the hammer to prevent damage caused by repeated swinging, and preserves much of the energy of the hammer, making the whole thing more efficient and minimizing wear. Unfortunately, the pawls are four extra moving parts and an additional axle, but they help us avoid making eight or more moving parts that we would need if we were to use more hammers. Lars: "I was up in a balloon the other day when the chainsaw store called to tell me that the saw and Handburger Helper Handle was there, but then the balloon came crashing down the next day when they told me that the bar won't fit on the engine! They are '100% positive' that they've got another one that fits it, and can get it up by the 19th, so that's where we are. If that fails, I'm going to demand that they become one of our corporate sponsors, and give us the longest barred saw that they have during the contest in exchange for advertising. Maybe we'll have a corporate sponsor!" Hopefully they'll get us a chainsaw with a 40 inch or longer bar in time for the competition. If not, we'll have to resort to hot wire slab cutting or cutting the slabs from both sides with a shorter saw like we did last year. We spent too much time trying to align the cuts last year, though. If we have to use that method this year, we'll probably settle for rougher cuts and then smooth the slabs with a large nailboard. Strangely there is not much to report. We continue to work on tools and designs, but our preparations aren't so frantic as they were last year. We have a much better idea of what we are doing this year, a better command of the medium, and more sophisticated tools. Hopefully we aren't victims of false confidence, but, although there is still much to do, there seems to be plenty of time to do it. I leave for Fairbanks in eleven days, and I only have a few more days before my shipping deadline. I'm taking more stuff with me this year, but that means I'll have less to do in the shop at Belfair after my arrival. Lars writes, "The giant router is tacked together, and needs a little alignment and bit sharpening and final welding, but then it'll be fully ready to use." The router is actually a long, custom attachment for his drill press. The drill press is mounted over a table, and the giant router bit goes through the table and is fixed to a bearing on the under side. 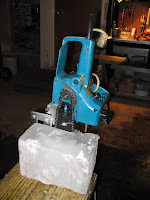 It should be great for precision cutting of large machine parts out of slabs of ice. We're closing in on a final chime design, and much progress is being made on the cam and hammer design, though it is still somewhat up in the air. Before long we might actually know what our sculpture will look like! What do you get when you pair architects with minimalist artists and turn them loose on media (snow and ice) they have little or no experience with? The Snow Show is a book filled with wonderful, full-color photographs of the results, creations that are beautiful and interesting enough to more than make up for being somewhat monotonous. Unfortunately, the book also features page after page of uppity, dysfunctional prose. Even the show's web site, with its "this experience is more important than anything else you could possibly be doing" full-screen presentation, manages to express the worst along with the best of the. . . Okay, I should stop now. Get this book for your coffee table and leave it there. Snow Sculpture and Ice Carving is about as contrasting a book on the subject as could be imagined. A product of 1970's craft culture, James Haskins's book features black and white photos of sculptures that are more accessible if a bit crude. I didn't find the book terribly interesting, however, as it is heavy on ideas for what to carve but light on technique. Cam and hammer design has been the topic of much discussion lately. Lars and I both realized that, if we were to simply add extra pins to the cylinder on the original model in order to play all the notes in the tune, several of the pins would end up too close together such that a swinging hammer would crash into an upcoming pin before striking the chime (despite the fact that our tune features no rapidly repeating notes). 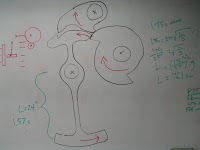 A related problem we've begun to consider is that we will have no control over the speed of rotation of the camshaft. There is no way to be certain that someone won't come along and turn the crank much faster than we would prefer. (Computer geeks like me call this an input validation problem.) Even if we have designed the pins so that they don't get clobbered by the hammer when turned at what we think is a reasonable speed, they could still be damaged when someone turns the crank too fast. Yet another related problem is the speed at which the hammers swing. Since each one is essentially a simple pendulum, increasing the scale from model size means that the period also increases. It wouldn't do to have a hammer take longer to swing to and from a chime than the duration between two repeated notes, and that duration is completely dependent on the whim of the crank turner! A solution we are likely to try is to use multiple hammers (probably two) for each chime. With only one hammer per chime, we will have repeated notes as little as 0.75 seconds apart, but two alternating hammers would increase the minimum repetition to 1.75 seconds (2.75 if we add a third hammer to the most frequently used chime). Another solution might be to create some kind of mechanism to prevent the crank from being turned too fast or to prevent the hammers from swinging when it is turned too fast. 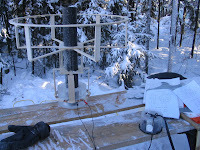 Lars writes, "Once it gets colder, I might start building machine parts and putting things together at random!" 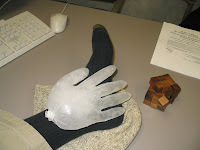 I went to the hospital cafeteria to see if I could get a bag of ice for a swollen ankle. They didn't have any bags on hand, so they gave me a latex glove to fill. It did the trick! I hurt the ankle by blocking a shot in a hockey game a couple weeks ago. It didn't seem to be healing very well, so I had it looked at. There was a faint line in one of the images, but doc says he doubts it is a fracture. It is a bone bruise that may take a while to fully heal, but I get to keep playing. 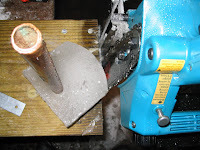 Lars has recently made a number of improvements to the ice lathe he made last year. He added legs, a tool rest, and some kind of chucks to hold the workpiece in place. He writes, "the chucks work great! I had to keep tightening them as the piece was turning, since it's above freezing right now. . . . I wore a hockey helmet in case of disintegration." 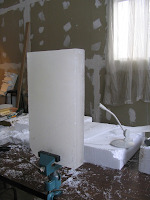 I spent most of the weekend working on ice chimes. 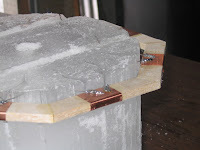 After a serendipitous discovery during the 2006 competition, it seemed that it would be fairly easy to make rectangular chimes out of ice. Unfortunately, it has been hard to improve upon the original, lucky design. Although it is difficult to produce large blocks of ice in Colorado's climate, recent weather has made it easy to produce slabs of ice by freezing water in shallow, cardboard boxes lined with garbage bags. I had hoped to be able to make rectangular bars of ice attached at one end, but it has turned out to be difficult to get good tones that way. I've had better luck with bars that are free on both ends and attached about a quarter of the bar length from each end, like the bars on a xylophone. 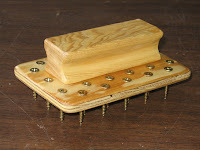 In fact, our music box will probably end up sounding quite a bit like a xylophone. I made chimes of varying shapes and sizes and digitally recorded the tones they produced. 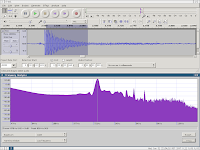 Some handy, open-source software made it easy to analyze the spectrum produced by each chime. With bars free on both ends, the chimes produced tones as expected according to various sources identifying Young's Modulus for ice. The Single Block Classic will begin at 9:00 AM on Tuesday, February 27th, only four weeks away! 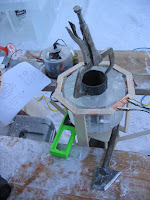 Lars and I have registered and intend to build a working music box entirely out of ice. The sculpture will be based on the model Lars sent me a couple months ago, although we will have to change a few things. The chimes will be solid and rectangular rather than hollow and cylindrical. The hammer mechanism will require significant modification due to differences of scale (long pendulums swing slowly) and material. We will have four chimes instead of one, enabling a tune to be played. The tune will be Westminster Quarters, the familiar clock chime tune. As it was originally written for mechanical chimes not unlike ours, it has several features that make it well suited for our music box. For one thing, it only uses four pitches. Another nice feature is that no pitch is repeated quickly. Combined with the facts that it is universally recognized and continues our clock theme, these features made it an easy choice. The sculpture will be called "Counterclockwise." There is still a great deal of work to be done in preparation for the event. 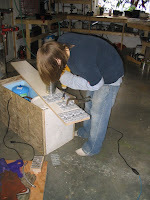 Lars is making improvements to the wonderful power tools he made for last year's competition. 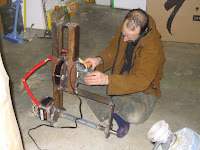 I've been working on designing and testing chimes and hammers as well as making hot wire gear cutters. I tried attaching a mending plate to my quarter-sheet orbital palm sander, but it didn't do anything but cut my thumb! (The injury was during installation; once in place it was actually quite secure.) I think the problem was that the little sander didn't move the abrasive surface enough in comparison to the distance between points on the mending plate. I think a device with a larger orbit would be pretty cool, though. 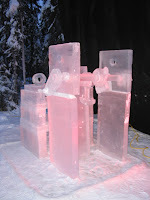 We received an email confirming our registration for the Single Block Classic at the 2007 World Ice Art Championships. It's a good thing too, because I had already purchased my plane ticket. 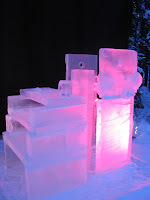 The Multi-Block event is already completely full, so there will be plenty of giant ice sculptures to enjoy this year. I tried it today, and it works great! I guess I shouldn't have spent all that time making my wooden nailboard. 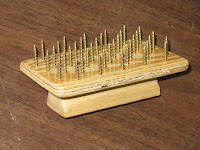 Attaching a whole bunch of these mending plates to a board would be a very quick way to make a large nailboard. Today I tested a new hot wire gear cutter made of balsa, copper, and 21 AWG nichrome wire. 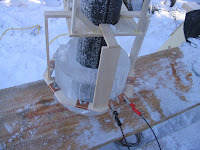 I cut an eight inch cylinder of ice with the table-mounted chainsaw and placed the cutter on top of the cylinder. I still need to make an axle-mounted guide to keep the cutter steadily moving vertically without tilting or rotating, but I decided to do the first test without a guide. As current was applied, the cutter started to slowly work its way through the ice. My power supply was only producing about 50W; it was enough to do the job, but I'd like to find a larger transformer that will cut faster and enable cutting of larger gears. The finished gear had several flaws due to the lack of a guide but otherwise was beautiful. Making cutters like this one will take quite a bit of time, but the actual cutting time is very short. I think that this will be our gear cutting method for this year's event. 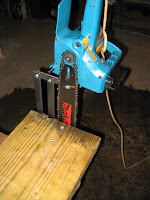 I tested a new table mount for my little, electric chainsaw tonight. It is made of steel flats and some nuts and bolts, and it allows the chainsaw to be used like a table saw but with more cutting depth. My first use for it will be to precisely cut experimental ice chimes, but it may be handy during the competition as well. I also hope to use it to mill some boards from any trees I have to cut down this summer due to beetle kill. The initial tests went very well. If Lars's 10", stationary, ice cutting, rotary bit doesn't make it redundant, I think we will find it quite useful. 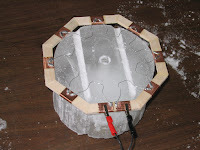 It worked very well for cutting arcs and discs by inserting an axle perpendicular to the table-top and rotating the ice around the axle. Steve Michel wrote to let me know about his amazing Excel spreadsheet for gear design. I probably won't need it this year, but I'll definitely keep it in mind for the future. I found my new nailboard to be quite useful while making the snowflakes. 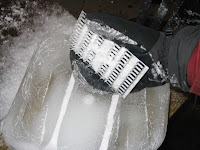 I used it to even out the 1/2" plates of ice out of which each snowflake was carved. I made the nailboard a few weeks ago but didn't try it out right away. It works like a mega-coarse grit sanding block. 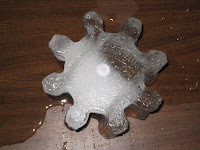 I carved a small sculpture of three snowflakes to take to a New Year's Eve party. 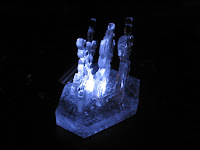 I tried to photograph them illuminated by a small reading light housed in a small cavity in the base of the sculpture, but only a couple of the photos turned out to be useful. I really need to use a tripod for this sort of thing. The snowflakes were about 0.5" thick and were pretty fragile. I think I repaired thirteen separate breaks while making the things. Fortunately, two out of three snowflakes actually survived the journey to the party! 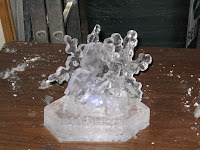 I think the sculpture would have been easier to carve on a larger scale, but I was limited by available ice. I took a photo with flash as well. It isn't as pretty, but at least it captured details despite my unsteady hands.